I came across former NASA climate scientist James Hansen’s email last week supporting a carbon tax. At the outset, I fully support this policy because it is the most economically effective way to achieve CO2 emission reductions. An important point is this: it matters a lot how we apply the tax and what happens to the money raised because of it. Many policy analysts think that the only way a carbon tax will ever pass is for the government to distribute the revenue via dividends to all households. This obviously has appealing aspects, not least of which is Americans love free stuff. That is, we love to reap the benefits of policies so long as they cost us nothing. That attitude is obviously unsustainable – you have simply to look at the state of American infrastructure today to see the effects. All that said, the specific carbon tax plan Hansen supported came from a Regional Economic Models, Inc. report, which the Citizens Climate Lobby commissioned. The report found what CCL wanted it to find: deep emission cuts can result from a carbon tax. There isn’t anything surprising with this – many other studies found the exact same result. What matters is how we the emission cuts are achieved. I think this study is another academic dead-end because I see little evidence how the proposed tax actually achieves the cuts. It looks like REMI does what the IPCC does – they assume large-scale low-carbon energy technologies. The steps of developing and deploying those technologies are not clearly demonstrated. Does a carbon tax simply equate to low-carbon technology deployment? I don’t think so. The blue line with diamonds shows historical CO2 emissions. The dark red line with squares shows EIA’s 2013 projected CO2 emissions through 2030. EIA historically showed emissions higher than those observed. This newest projection is much more realistic. Next, the green triangles show the intended effect of EPA’s 2014 power plant rule. I compare these projections against Kyoto `Low` and `High` emission cut scenarios. An earlier post showed and discussed these comparisons. I added the modeled result from REMI 2014 as orange dots. Let me start by noting I have written for years now that we will not achieve even the Kyoto `Low` scenario, which called for a 20% reduction of 1990 baseline emissions. The report did not clearly specify what baseline year they considered, so I gave them the benefit of the doubt in this analysis and chose 2015 as the baseline year. That makes their cuts easier to achieve since 2015 emissions were 20% higher than 1990 levels. Thus, their “33% decrease from baseline” by 2025 results in emissions between Kyoto’s `Low` and `High` scenarios. REMI starts with a $10 carbon tax in 2015 and increases that tax by $10/year. In 10 years, carbon costs $100/ton. That is an incredibly aggressive taxing scheme. This increase would have significant economic effects. The report describes massive economic benefits. I will note that I am not an economist and don’t have the expertise to judge the economic model they used. I will go on to note that as a climate scientist, all models have fundamental assumptions which affect the results they generate. The assumptions they made likely have some effect on their results. Why won’t we achieve these cuts? As I stated above, technologies are critical to projecting emission cuts. What does the REMI report show for technology? The left graph shows US electrical power generation without any policy intervention (baseline case). The right graph shows generation resulting from the $10/year carbon tax policy. Here is their models’ results: old unscrubbed coal plants go offline in 2022 while old scrubbed coal plants go offline in 2025. Think about this: there are about 600 coal plants in the US generating the largest single share of electricity of any power source. The carbon tax model results assumes that other sources will replace ~30% of US electricity in 10 years. How will that be achieved? This is the critical missing piece of their report. Look again at the right graph. Carbon captured natural gas replaces natural gas generation by 2040. Is carbon capture technology ready for national-level deployment? No, it isn’t. How does the report handle this? That is, who pays for the research and development first, followed by scaled deployment? The report is silent on this issue. Simply put, we don’t know when carbon capture technology will be ready for scaled deployment. Given historical performance of other technologies, it is safe to assume this development would take a couple of decades once the technology is actually ready. Nuclear power generation also grows a little bit, as does geothermal and biopower. This latter technology is interesting to note since it represents the majority of the percentage increase of US renewable power generation in the past 15 years (based on EIA data) – something not captured by their model. The increase in wind generation is astounding. It grows from a few hundred Terawatt hours to over 1500 TWh in 20 years time. This source is the obvious beneficiary to a carbon tax. But I eschew hard to understand units. What does it mean to replace the majority of coal plants with wind plants? Let’s step back from academic exercises that replace power generation wholesale and get into practical considerations. It means deploying more than 34,000 2.5MW wind turbines operating at 30% efficiency per year every year. (There are other metrics by which to convey the scale, but they deal with numbers few people intuitively understand.) According to the AWEA, there were 46,100 utility-scale wind turbines installed in the US at the end of 2012. How many years have utilities installed wind turbines? Think of the resources required to install almost as many wind turbines in just one year as already exist in the US. Just to point out one problem with this installation plan: where do the required rare earth metals come from? Another: are wind turbine supply chains up to the task of manufacturing 34,000 wind turbines per year? Another: are wind turbine manufacturing plants equipped to handle this level of work? Another: are there enough trained workers to supply, make, transport, install, and maintain this many wind turbines? Another: how is wind energy stored and transmitted from source to use regions (thousands of miles in many cases). Practical questions abound. This report is valuable as an academic exercise, but I don’t see how wind replaces coal in 20 years time. I want it to, but putting in a revenue-neutral carbon tax probably won’t get it done. I don’t see carbon capture and sequestration ready for scale deployment in 10 years time. I would love to be surprised by such a development but does a revenue-neutral carbon tax generate enough demand for low-risk seeking private industry to perform the requisite R&D? At best, I’m unconvinced it will. After doing a little checking, a check reminded me that British Columbia implemented a carbon tax in 2008; currently it is $40 (Canadian). Given that, you might think it serves as a good example of what the US could do with a similar tax. If you dig a little deeper, you find British Columbia gets 86% of its electricity from hydropower and only 6% from natural gas, making it a poor test-bed to evaluate how a carbon tax effects electricity generation in a large, modern economy. Categories: economy, energy, global warming, policy, science | Tags: 2014 EPA rule, climate change, climate policy, CO2 emissions, EIA, energy, energy policy, Kyoto Protocol, REMI | Permalink. If you follow climate and energy news, you probably have or will encounter media regarding today’s proposed CO2 emissions rule by the EPA. Unfortunately, that media will probably not be clear about what the rule means in understandable terms. I’m writing this in an attempt to make the proposed rule more clear. 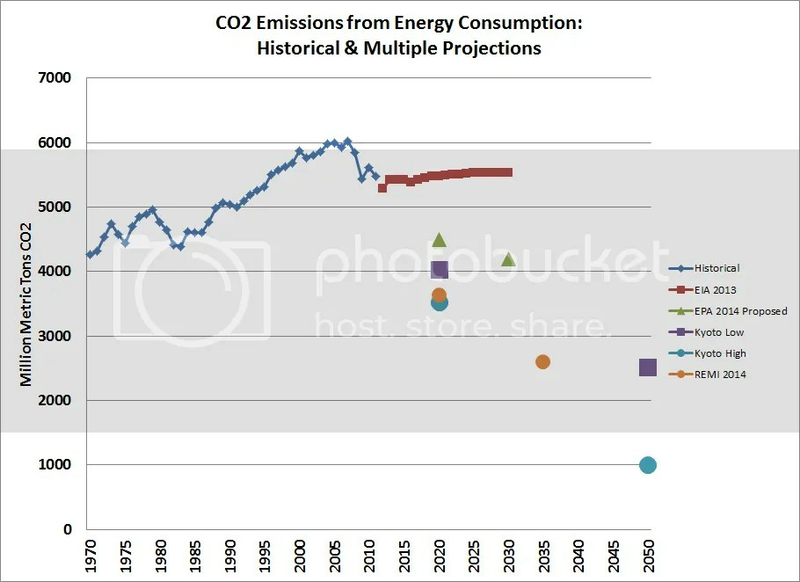 The graph above shows US CO2 emissions from energy consumption. This includes emissions from coal, oil, and natural gas. I have differentiated historical emissions in blue from 2013 EIA projections made in red, what today’s EPA proposal would mean for future emission levels, and low and high reductions prescribed by the Kyoto Protocol, which the US never ratified. In 2011, historical US energy-related emissions totaled 5,481 million metric tons of CO2. For the most part, you can ignore the units and just concentrate on emission’s magnitude: 5,481. If the EPA’s proposed rule goes into effect and achieves what it sets out to achieve, 2020 emissions could be 4,498 MMT and 2030 emissions could be 4,198 MMT (see the two green triangles). Those 2030 emissions would be lower than any time since 1970 – a real achievement. It should be apparent by the other comparisons that this potential achievement isn’t earth shaking however. Before I get further into that, compare the EPA-related emissions with the EIA’s projections out to 2030. These projections were made last year and are based on business as usual – i.e., no federal climate policy or EPA rule. Because energy utilities closed many of their dirtiest fossil fuel plants following the Great Recession due to their higher operating costs and the partial transfer from coal to natural gas, the EIA now projects emissions just above 2011’s and below the all-time peak. I read criticism of EIA projections this weekend (can’t find the piece now) that I think was too harsh. 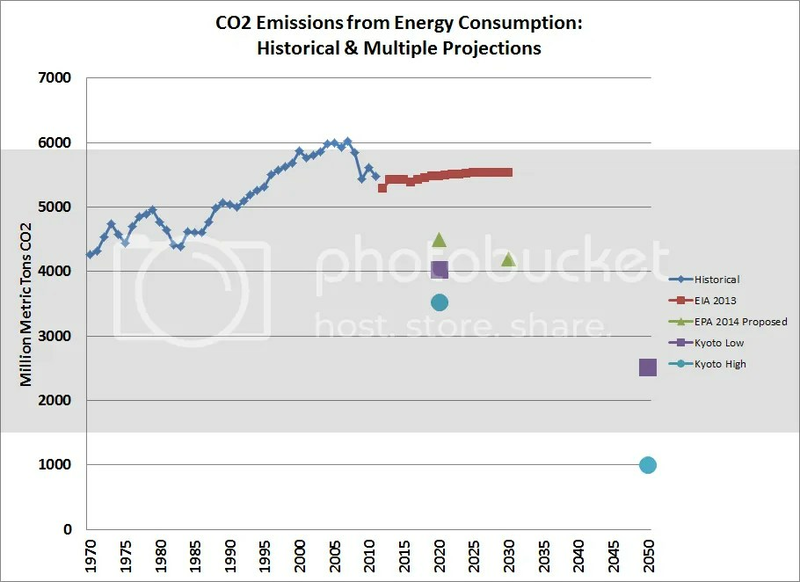 The EIA historically projected emissions in excess of reality. I don’t think their over-predictions are bad news or preclude their use in decision-making. If you know the predictions have a persistent bias, you can account for it. So there is a measurable difference between EIA emission projections and what could happen if the EPA rule is enacted and effective. With regard to that latter characterization, how effective might the rule be? If you compare the EPA emission reductions to the Kyoto reductions, it is obvious that the reductions are less than the minimum requirement to avoid significant future climate change. But first, it is important to realize an important difference between Kyoto and the EPA rule: the Kyoto pathways are based off 1990 emissions and the EPA is based off 2005 emissions. What happened between 1990 and 2005 in the real world? Emissions rose by 19% from 5,039 MMT to 5,997 MMT. The takeaway: emission reductions using 2005 as a baseline will result in higher final emissions than using a 1990 baseline. If the US ratified and implemented Kyoto on the `Low` pathway (which didn’t happen), 2020 emissions would be 4,031 MMT (467 MMT less than EPA; 1445 MMT less than EIA) and 2050 emissions would be 2,520 MMT (no comparison with EPA so far). If the US implemented the `High` pathway, 2020 emissions would be 3,527 MMT (971 MMT less than EPA! ; 1,949 MMT less than EIA!) and 2050 emissions would be drastically slashed to 1,008 MMT! Note the comment at the bottom of the graph: global CO2 emissions have to turn negative by 2070, following decades of declines. How will global emissions decline and turn negative if the US emits >3,000 MMT annually in 2050? The short answer is easy: they won’t. I want to combine my messages so far in this post: we have an enormous amount of work to reduce emissions to the EPA level. That level is well below Kyoto’s Low level, which would have required a lot of work in today’s historical terms. That work now lies in front of us if we really want to avoid >2C warming and other effects. I maintain that we will not reduce emissions commensurate with <2C warming. 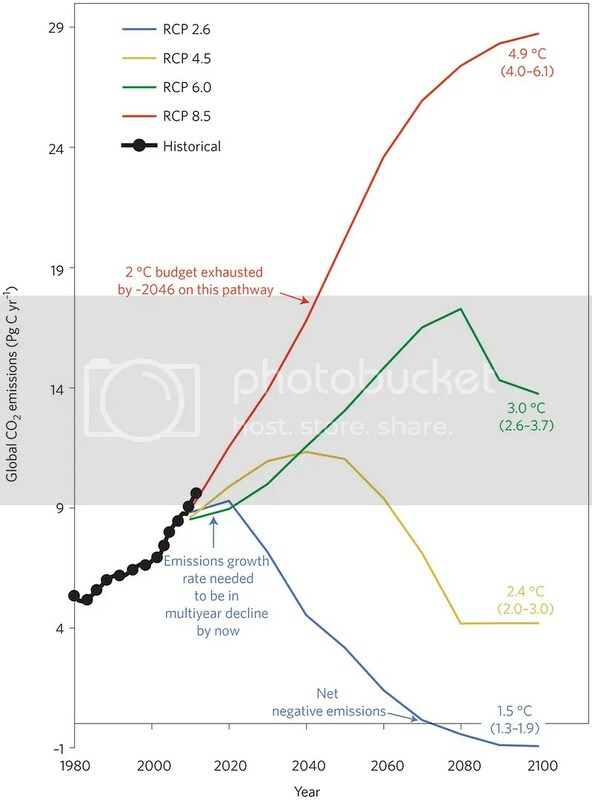 I think we will emit enough CO2 that our future will be along the RCP6.0 to RCP8.5 pathways seen above, or 3-5C warming and related effects. Another important detail: the EPA’s proposed rule has a one-year comment period which will result in a final rule. States then have another year to implement individual plans to achieve their reductions (a good idea). The downside: the rule won’t go into effect until 2016 – only four years before the first goal. What happens if the first goal isn’t achieved? Will future EPA administrators reset the 2030 goal so it is more achievable (i.e., higher emissions)? Will lawsuits prevent rule implementation for years? There are many potential setbacks for implementing this rule. And it doesn’t achieve <2C warming, not even close. Categories: energy, global warming, policy, science | Tags: 2014 EPA rule, climate change, climate policy, CO2 emissions, EIA, energy, energy policy, Kyoto Protocol, RCP6, RCP8.5 | Permalink. Research: Natural Variations in Atlantic Drive Extreme Winters (abstract here). This research identifies the Atlantic Multidecadal Oscillation as the primary driver of blocking patterns (via the North Atlantic Oscillation) that have caused extreme cold winters over Europe and east US in recent years. This Oscillation is a natural feature of the climate system. This means that anthropogenic effects on extreme winters are likely not the dominant factor. This challenges many climate activists’ statements that extreme weather we experience today are man-made. The actual message is more nuanced. The work combines 20th century observations with climate model results. They write “A negative NAO in winter usually goes hand-in-hand with cold weather in the eastern US and north-western Europe.” The observations also suggest that it takes around 10-15 years before the positive phase of AMO has any significant effect on the NAO. The AMO has been positive since the early 1990s. 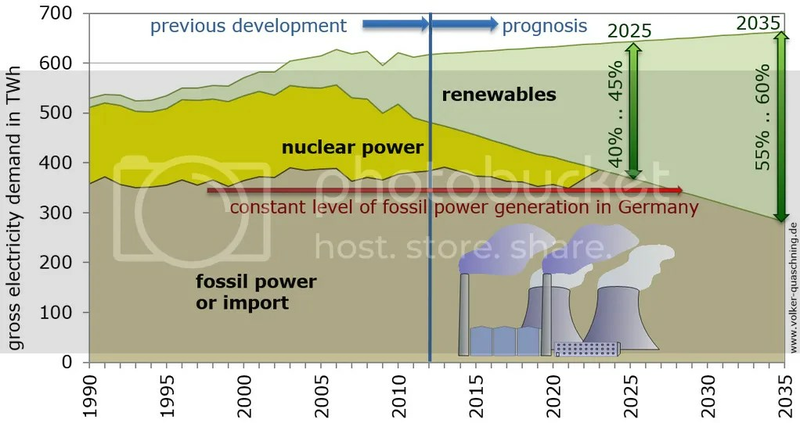 As indicated in the graphic, fossil power generation could hold constant until 2029, then decline as additional renewable power comes online. In the aftermath of Japan’s Fukushima nuclear power plant disaster, Germany is decommissioning their nuclear power plants. What I find interesting in this graphic is Germany projects renewables will pick up the electricity generation lost by nuclear power in the next 15 years as well as satisfy new electric demand. Only after that would renewables eat into fossil power generation. I’m not an expert on the German energy system, but I do know based on my expertise that this projection means Germany will not accelerate system decarbonization until 2030, give or take a few years. By direct consequence, Germany’s CO2 emissions will likewise not decline until 2030. This provides additional evidence that CO2 emissions will not decline soon enough to avoid 2C warming by 2100. We don’t have 15 more years to act if that’s really the goal. Emissions have to start declining in 2014-2015 if 2C is the goal. This projection tells me Germans are more willing to accept unknown but certain and common climate change risks but are unwilling to accept known but rare nuclear power risks. Two new solar projects will be built in Arizona. This news isn’t terribly unique; companies make similar releases regularly now. What I wanted to point out is the scale of the projects compared to the scale of electricity needed. These systems will generate 42.76MW of electricity. The mean size of a coal plant in the US is 667MW. Thus, 15-16 new solar projects of this size have to be built to substitute solar generation for one coal plant. Remember, then number of coal plant retirements is increasing. Demand is also increasing. 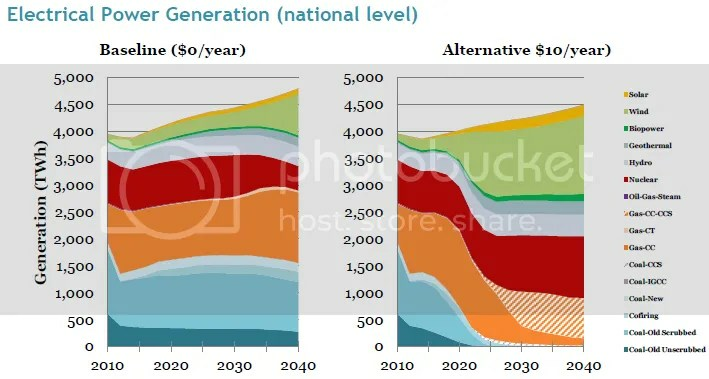 As in the case of the graphic above, renewable energy generation has to replace existing generation but also meet demand that doesn’t currently occur. In 2012, coal generated 1,514,043 thousand MWh, natural gas generated 1,225,894 thousand MWh, and renewables generated 218,333 thousand MWh (141,000 by wind; 4,000 by solar). To displace coal and later natural gas in the next 50 years, we have to boost the number of solar and wind projects by 10-100X. I cheer every new project announcement; we need many more of them. 3 Dont’s: Ed Maibach, director of George Mason University’s Center for Climate Change Communication, says there are at least three things “we know that you shouldn’t do,” when communicating the science: don’t use language people don’t understand, don’t use too many numbers, and don’t talk about “plants, penguins and polar bears” instead of people. Maibach says another error is talking about the threat of climate change without giving people solutions. Guess what most activists do (and did historically)? They use inappropriate language, they talk mostly about numbers, and they talk about polar bears. Moreover, they talk about threats (devastation, civilization ending, epic disasters, apocalypse , trouble, strife, etc.) and don’t offer solutions. Is it any wonder most people remain disconnected on the topic? It’s not to me. What makes this worse? People “aggressively filter” information that doesn’t conform to their worldview. The more education they have, they more they filter that information. Thus, climate believers are more likely to believe in climate change with more education and climate skeptics are more likely not to believe in climate change. It’s not a matter of education; it’s a matter of values. Climate communicators therefore need to talk to people about people in their local setting, not obscure numbers of global phenomena. Among other things, the EIA’s January report shows total January energy production in 2014 than 2013 or 2012. Most of the renewable energy in the graphs are hydroelectric, not wind or solar, which continue to lag far behind other generation sources despite recent year-over-year percentage increases. It also shows that contrary to pro-fossil fuel industry claims, the cost of residential energy continued to hold steady, as it has for 30 years now. In other words, adding renewable energy doesn’t significantly impact energy costs. As the US shifts from coal to natural gas (not coal to renewables), US GHG emissions falls led developed countries in 2012: by 3.4% vs. 1.3% for the EU (see German energy generation above). That’s one way to measure progress. Another: actual EU emissions are far lower than US emissions compared to 1990. That means the US, as the 2nd largest GHG emitter worldwide, has a very long way to go before it achieves stated climate goals. The Obama administration for instance has a recent talking point that the US will meet 2020 GHG emission cut goals due to their leadership. The big devil in the details: they’re using 2005 emissions instead of 1990 emissions. Even if you don’t know the exact numbers, you should be able to state with confidence that 2005 US emissions were higher than 1990 emissions because we weren’t deploying renewable energy, our population grew, and our demand per person grew. Well, the EU’s emission cuts reference their 1990 levels. Moreover, peak US GHG emissions occurred in 2005. It’s easy to hit big percentage cuts from a maximum value; it’s much harder to hit those same percentage cuts from an intermediate value. The US would have to cut all emissions from 1990 to 2005 and then an additional amount from 1990 to achieve Kyoto goals. We will not achieve that by 2020 under current policies because we never wanted to. We may not achieve a 17% reduction in 1990 emissions by 2030. This constitutes a persuasive argument that <2C warming by 2100 will not occur. In rereading my list of topics to cover in this post, I found a couple that deserve more singular attention. More to come later this week. Categories: energy, environment, global warming | Tags: 1990 baseline, 2005 baseline, 2C warming, Atlantic Multidecadal Oscillation, climate communication, climate science, EIA, electricity portfolio, EU emissions, extreme weather, fossil power, Fukushima, German energy, Kyoto Protocol, nuclear power, renewables, US emissions | Permalink. I enjoyed guest teaching for the second time this week in a Climate Policy Implications class for senior undergraduate and graduate students. On Tuesday, we watched most of Leonardo DiCaprio’s “11th Hour“. Yesterday, the class first broke into groups to discuss their reactions. I was pleased to hear how many clearly identified the negative emotions invoked by disaster imagery. They felt, as most people do, uninspired to take action based solely on the images in the first part of the movie. I know DiCaprio feels strongly about this issue, and I don’t intend that this commentary as a slight against his efforts. As I told the class, I’m sure designing, shooting and editing a documentary is an expensive, laborious affair. That said, the class agreed that the classic recipe for this type of film needs to change. More on that below. The smaller groups shared their group discussion’s themes with each other. A couple of students commented that their discussions tend to converge to the same point class after class. I had the same experience when I took the course. I think the reason is the silo-ing effect of same-tribe thinkers. The students are taking a Climate Policy Implications class because, for whatever reason, they are motivated to do something about climate change. After a handful of classes, discussions are likely to repeat and feel stale. The key is for someone to play devil’s advocate – even if they don’t announce that effort beforehand. Thought doesn’t become critical until you face a different viewpoint and are forced to logically defend your own beliefs. What does 400 ppm mean? 8.5 W/m^2? 2C warming? More specifically to my project, what does MMT CO2 or MMT CO2/$1,000 GDP mean? These concepts are extremely abstract and our reaction to them is typically to push them aside and convince ourselves that we understand them well enough to continue with the discussion. But we don’t. Sure, experts have highly technical definitions and work with these units, but what about the public whom those experts are trying to convince climate change is a Really Important Subject? How can they understand the scope and scale of the policy goals scientists push with increasing fervor? Here is one way. Assume the US ratified the Kyoto Protocol (never happened) and is working to achieve both 2020 and 2050 CO2 emission reduction goals. Assume further that the US will not experience any increase in energy demand between 2008 and 2050 (it helps simplify some math). In order to achieve CO2 emission reductions, our fossil fuel dominant energy portfolio needs to change into a renewable dominant portfolio. So I used non-fossil power plants as my final metric by which to measure emissions reductions (again, because MMT CO2 is too abstract a concept). Based on emissions and GDP data through 2008, the US would have to build and operate over 400 nuclear power plants between 2008 and 2020 ( and more than 1,000 by 2050) to achieve Kyoto Annex I 2020 and 2050 emissions goals. Put another way, the US would have to build, install, and operate nearly 400,000 wind turbines between 2008 and 2020 (and ~1.05 million wind turbines by 2050) to achieve 2020 and 2050 emissions goals. Those Kyoto emissions goals are in line with keeping global annual mean temperatures in 2100 near 2C warmer than pre-industrial temperatures. And those numbers are just for the US. In 2008, the US emitted just under 1/5 the globe’s CO2 emissions. Without any increase in energy usage between 2008 and 2050 globally (think that will happen? ), scale those numbers up by 5. If developing countries want to develop (they should and they are), we have to scale those numbers up even more. To put it simply, we aren’t accomplishing those goals. Not one country is – even those EU countries who ratified Kyoto and even tried to implement new energy policies that were more aggressive than those in the US. We aren’t building dozens of nuclear power plants per year or tens of thousands of wind turbines per year or thousands of solar thermal plants per year. We will not meet 2020 Kyoto emissions reduction goals. We will not meet 2050 Kyoto emissions reduction goals. What do those statements mean? To me, the headline take-home message – and I’ve written about this since I convinced myself of it with this project – is we will not keep global annual mean temperatures in 2100 below 2C warmer than pre-industrial temperatures. The scale and scope of that goal is – currently – too big. Absent significant technological research investment and innovation, followed by deep and widespread market deployment of new technologies, global temperatures in 2100 will very likely exceed 2C. On our current emissions trajectory, global temperatures in 2100 will likely be between 4C and 6C warmer than pre-industrial temperatures. That is an important acknowledgment to make, based on sound science and math. And here is where I break with contemporary scientists: I won’t make a normative statement about those projections. They are what they are. Given their likelihood, adaptation becomes just as important to me as mitigation. We of course have to mitigate to the maximum extent we can. But we will increasingly force the climate the rest of this century and into future centuries. That forcing will result in climate change effects that we have to address – there is no getting around that. Wishing it weren’t so won’t make it so. I tried to convey to the class that while recognizing this scope is sobering, I use it while doing my research as motivation. Where there is challenge, there is also opportunity. It is up to us to reach for that opportunity. Going back to my first paragraph, I told the class that we are responsible for changing the documentary recipe. I asked if any of them had friends they knew in different university departments: film, creative writing, etc. Could they begin to work with these folks to redefine climate documentaries in an attempt to inspire people? We are responsible for asking new and different questions about climate change so that we can identify new and different answers and opportunities. It’s also what I want to accomplish with this blog. Categories: environment, framing, global warming, policy, science, technology | Tags: 11th Hour, 2C warming, 350ppm, 400ppm, 4C warming, 6C warming, climate change, climate change catastrophes, climate policy, energy policy, GHG concentrations, GHG emissions, Inconvenient Truth, Kyoto Protocol, public engagement, science policy, US decarbonization | Permalink. Carbon Emissions: Who Is Doing vs. Who Has Done More? I have included data from 5 years: 1971 (the first of the dataset), 1990, 1999, 2006, and 2009 (the last year with data). The blog post I link to above asks which nation has reduced CO2 emissions the most since 2006. In many ways, this is like choosing 1998 for the start of a global temperature data comparison. You can do it, but that doesn’t mean you should do it. I will use 2006-2009 as the baseline against which I make comparisons with other start years. The story changes (of course) when you do this. How did the US fare from 2006 to 2009? Emissions were reduced (-9%), there is no denying that. The Great Recession and the relatively widespread switch from old expensive coal plants to newer cheaper natural gas plants accounted for most of that reduction. How do we know? What is the US’s national climate policy? We don’t know because we don’t have one. Sure, there are actions that the EPA and other agencies of the Obama administration have taken, but they occurred simultaneously with the recession and market responses to a different cheap fuel. It will take years before their effects are noticeable in aggregate numbers like total CO2 emissions. But look, most European nations’ emissions were also reduced during the 2006-2009 time period. The biggest factors: the Great Recession and austerity measures keeping economies from growing. What does the next time period show us? From 1999 to 2009 (11 years), US emissions fell by 6% – still a noteworthy accomplishment given the lack of national policy pushing us towards any type of meaningful goal. How did European nations do in comparison? Belgium, Denmark, Germany, Hungary, Portugal, Slovak Republic, Sweden, and the United Kingdom all posted double-digit percentage emission declines. All but two of those countries posted double the US’ 6% value (>=12%). What happened in the late-1990s? The signing of the Kyoto Protocol (all except the US, of course). Did the European nations hit their Kyoto targets? No, but they decreased their CO2 emissions substantially. I often write that we should benchmark nations’ CO2 emissions to 1990, since that was prior to Kyoto or even the Rio Conference. In other words, before emissions garnered widespread international attention. Let’s compare the US and European nations on that basis. I would further advocate for this comparison because of the length of time involved: 19 years, which represents a lot of time. Unsurprisingly, US emissions increased from 1990 to 2009 – by 7%. What about their European counterparts? In this case, I’ll collect all the nations who posted emission decreases. Belgium (-6%), Czech Republic (-29%), Denmark (-6%), Estonia (-58%), Germany (-21%! ), Hungary (-28%), Italy (-2%), Poland (-16%), Solvak Republic (-42%), Sweden (-21%! ), and the United Kingdom (-15%). Well, well, well. It appears that Germany’s reputation for reducing emissions is pretty well deserved. Take away the former Eastern bloc nations and there are six European countries which accomplished something the US did not. The last column represents the longest look possible: from 1971 to 2009. I have never looked at this time frame and it held some surprises. In contrast to the US’ (+21%) change in CO2 emissions, Belgium (-14%), Czech Republic (-27%), Denmark (-15%), France (-18%), Germany (-23%), Hungary (-20%), Luxembourg (-33%), Slovak Republic (-15%), Sweden (-49%), and the United Kingdom (-25%) all posted declines compared to 38 years ago! Let’s give credit where credit is due: that is impressive! I am not saying that European countries are perfect or that they accomplished their task. Anything but: they still have positive emissions, which is changing the climate. But their emissions are, in yearly magnitude and in cumulative sum, dwarfed by the US’s. The US has a very long way to go before it can claim any environmental success story related to climate change. We do have things we can learn from the other side of the pond. We could start by developing and publicizing a national climate policy. Absent that, efforts from US mayors are needed and welcomed as part of a bottom-up approach, which I am convinced is the only way this problem will be tackled successfully. Categories: global warming, policy | Tags: climate policy, CO2 emissions, Kyoto Protocol, OECD countries emissions, Rio Conference | Permalink. Who’s right? Well, as usual, there are valid points made on both sides. It is true that a global market was created where none before it existed. In and of itself, that is probably a good thing. It allows us to monitor how such a program works and make modifications with time if something needs to be tweaked or overhauled. To that point, the critics make a good argument. The scheme very likely isn’t working. But critics will leave it at that without examining it in further detail. I’m going to look at one part of the scheme in a little more detail and explain why the scheme isn’t working as efficiently as it should. Categories: economy, global warming, policy | Tags: carbon market, climate change, CO2 market, global emissions credit market, global warming, Kyoto Protocol, policy, policy analysis | Permalink.